Nitro was formed in August of 2006 by Mike and Tracy Koleber. The Nitro program moved into their new 30,000 sq ft indoor swimming home in Cedar Park in June of 2007. Four years later, in May of 2011, they opened a second location, Nitro Swimming, Bee Cave. To this day, Tracy continues in her ownership role handling any and all of the "dry side" of Nitro, while Mike oversees the wet side of the operation. Over the last several years, Nitro Swimming has become the leading competitive swim team and swim lessons provider in the Austin, TX area. Head Coach and owner of Nitro, Mike Koleber, has come a long way from his days as an age group swimmer in Michigan. As a 13 year old, he began teaching swimming lessons on Saturdays to help out his father, who was a head coach in the area. After graduating high school, Coach Mike attended and graduated from Oakland University in Michigan where he was an 11-time NCAA All-American as well as team captain and Senior National Qualifier. Nitro Swimming currently has two locations in the Austin, TX area. Both locations have Olympic sized pools which can be easily converted from short course 25 yard lanes to long course 50 meter lanes. These swim centers, in the Cedar Park and Bee Cave areas are both indoor swim centers where conditions can be controlled year round. The swimming pools have state-of-the-art water quality systems, making them optimum for safety and performance. Each swim center also has a swim lessons only pool where temperatures and water quality are perfect for beginning and advanced swimmers. The Nitro coaches and swim lessons instructors are the best anywhere. Mike has handpicked his coaching and swimming lessons staff that includes a handful of former Olympians. 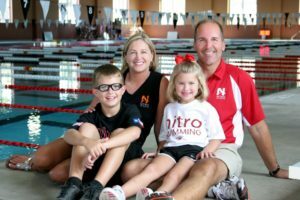 Common traits among all of the Nitro staff is their love for children, the sport of swimming and true dedication to teaching and inspiring kids to be the best they can be. Looking back, Mike credits his dad, Don Koleber, for the opportunity to learn from the best and ultimately igniting his dream to developing the leading competitive swim team and swim lesson program in the country. Nitro’s meteoric rise has been nothing short of phenomenal. In 2007, Nitro Swimming was 33rd at the Texas Age Group Swimming Championships. In 2008, they were 11th. 2010 (Long Course – July): 1st! 2011 (Short Course – March): 1st! 2011 (Long Course – July): 1st! 2012 (Short Course – March): 1st! 2012 (Long Course – July): 1st! 2013 (Short Course – March): 1st! 2014 (Long Course – July): 1st! 2015 (Long Course – July): 1st! 2016 (Short Course – March): 1st! 2016 (Long Course – July): 1st! 2017 (Short Course - March): 1st! 2017 (Long Course - July): 1st! 2018 (Long Course - July): 1st! 2019 (Short Course - March): 1st! Visible Improvement. Delivered with Passion. Every Day. Making the World a better place – one swimmer at a time.